Neil Perry's cassata is worth the effort and can be prepared the day before serving. 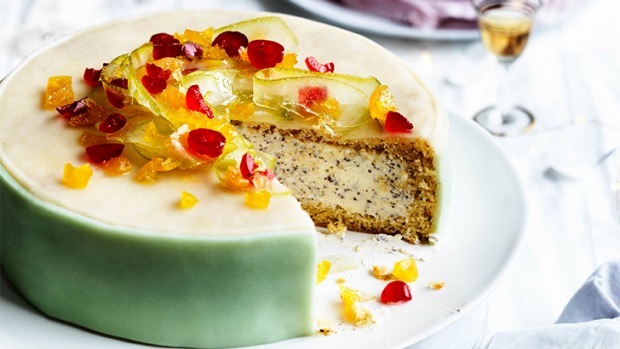 You can prepare this amazing cassata the day before you serve it. It's a bit of work but a lot of fun to make and it's worth the effort and "wow" factor. If you want to make it a bit easier, you can buy pre-made sponge. Preheat oven to 160°C. Whisk eggs and sugar with an electric mixer on medium speed until thick, pale and tripled in volume. Sift flour and baking powder into separate bowl, then fold into egg mixture in 3 batches. Spoon into a 24cm x 34cm x 5cm-deep cake tin lined with baking paper, smooth the top, and bake until sponge is golden and springs back when pressed (20-30 minutes). Cool completely. Mix ricotta and sugar in a food processor until smooth, add goat's curd, pulse to combine, stir in chocolate, pulse to combine. Set aside. Line a 22cm-diameter springform cake tin with cling wrap, leaving edges hanging over sides. On a piece of baking paper dusted with icing sugar, roll out 320g marzipan into a 35cm-diameter round. Line base and sides of cake tin with marzipan, pressing into tin with edges hanging over sides. Trim the top of the sponge until level, and trim the edges. Halve sponge horizontally and cut a 22cm-diameter circle from each half. Cut leftover sponge into 4.5cm x 3cm blocks. Place one sponge round in marzipan-lined tin, trimming to fit if necessary. Place sponge blocks around the edge, then brush marsala all over sponge. Spoon in ricotta mixture and smooth the top, then place second sponge round on top, and brush with marsala. Trim marzipan, cover cake with cling wrap, then weigh down using a flat plate with food cans. Refrigerate overnight. Remove cans, plate and outer ring of cake tin. Invert cassata onto a plate and remove cling wrap. Add a few drops of food colouring to remaining marzipan to achieve a delicate green. Knead well to soften slightly, then roll out to 35cm x 12cm x 2mm thick on a piece of baking paper dusted with icing sugar. Cut into two 35cm x 6cm strips, then press each piece against sides of cake, pressing edges to seal. Combine chopped fruit in a bowl, scatter over cake; cut into wedges and serve.